CONCORD, N.C. – It was a hot, steamy night at Charlotte Motor Speedway on Tuesday for round three of the 25th Annual Bojangles Summer Shootout Series, and a couple of drivers ended up hot under the collar with steam coming out of their ears. For most, however, there was close racing, close finishes and the usual amount of fun with their families and friends. This week’s Shootout report card could be summed up as a case of the good, the bad and the ugly, both on and off the track. I would say much of, or even most of, the evening was good. In fact, during the bandolero outlaw feature I suddenly realized that if the last two features went well, we could be finished with the entire program before dark. That didn’t quite happen but it was still just after 10pm when the final lap was run so that was still good. Justin Gareis won his third straight outlaws feature. It seems like that car just has something none of the other cars have. He’s doing a great job at the wheel, and that’s good. Luke Akers drove a smooth race to finish second, with Garin Mash third. Both of those drivers are hard working young racers who showed well on the night. Midwest racer Derek Lemke ran away with the legends Pro division race, his finest hour of the first three races. It’s fun to see new faces step up and win at the Shootout, so that was good. Dawson Cram also did good to finish second. This race had a little bit of “bad” in it, though, as some of the racers got over-aggressive and a couple of unnecessary crashes were the result. I have to wonder how much of a role the spotters play into the way the racers drive at times, but that’s another column for another day. One should expect that at the Pro level the level of respect would be higher. Hopefully that will be the case going forward. Zack Miracle surely did “good”, as did Landon Rapp. The pair finished first and second in the bandolero bandits division, Miracle has really stepped up his game this year. I’ve watched him at Concord and now at the shootout develop his skill set more and more. Both racers have a ton of upside potential for their future. In a clear case of “all’s good that ends good” (OK, I took a bit of liberty with that phrase, but, hey, it’s all good, right? ), The “bad” legends Young Lions feature that got shortened by two laps because the rash of yellows caused the time limit to expire, Tommy Good celebrated his first ever win in the division proudly when it was over. Tommy is a role model for his peers and his win was a popular one. Again, it seems like this division has been one of the most problematic in recent series, especially in the early rounds, and it has to fall on the parents and teams to teach these racers right. If they, or the spotters, are not properly coaching the drivers between and during races, then the result is going to be shortened races. Even the bandolero beginner bandits class got in on the “good”, as Luke Morey dove to the inside on the last lap off turn four in an attempt to pass leader Alex Meggs but came up just short. You naturally expect a bit of “bad” in this division because the racers are so young and inexperienced. Just like with Young Lions on the legends side, all you can hope for is that their parents and crews are teaching them to listen to race control’s direction and do what they’re supposed to do, so that the racing becomes cleaner and less chaotic as the series goes on. I saved the “ugly” for last, because that’s exactly where it deserves to be. The legends Masters division consists of drivers over 40 years of age. When I first started attending Summer Shootout races a dozen or so years ago, that class was the most fun to watch every night. Even if the other divisions had fantastic racing, it was the Masters who could start 24 cars and barely have a yellow. They all had fun on and off the track, and raced hard but with respect. The past few seasons, a small number of racers have made that class hard to watch at times. Tuesday was the perfect example. John Sossoman and Robbie Faggart were teammates going into the night. Each has had his own past indiscretions, but Tuesday night topped them all. Sossoman was inside of Faggart going down the back straightaway, and he crowded Faggart into the wall. Faggart turned his car down off the wall, spinning Sossoman in the process. Before Sossoman’s No. 14 was even completely stopped, he was enraged, flailing his belts off and opening his door to get out. Sossoman got out of the car, threw his gloves on the track, threw his helmet down (shattering it), then picked up what was left of the helmet (still attached to his forward head restraint) and threw it at Faggart’s car. As if that wasn’t “ugly” enough, the pair ended up in a fight in the garage area after the race. So much for teammates. Behavior like this cannot be tolerated at any sporting event (other than WWE). Both drivers should be suspended, and I believe Sossoman’s suspension should be permanent. Carl Cromier, one of the nicest gentlemen in the garage area, won the race, and his victory lane attention was spoiled by these other adults acting like children. I expect this type of nonsense on occasion at Bowman Gray Stadium, because that’s what they promote, and the racers are all adults so if some of them want to act like fools and trash their equipment that’s their choice. 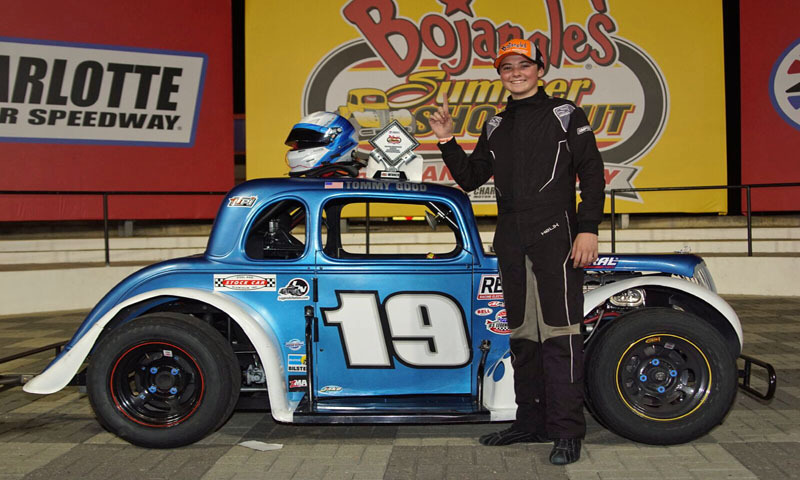 I don’t expect it at the Bojangles Summer Shootout, a series largely consisting of younger racers trying to have fun with their families and learn the skills they need to climb the racing ladder. I most certainly don’t expect it from the oldest racers in the garage. That incident wasn’t just “Ugly”. It was disgraceful. Those involved should be severely dealt with in a way that makes it crystal clear that there is zero tolerance for that type of behavior anywhere on the grounds at any time. Round three gets a “B” from me for overall show. I’m refusing to penalize everyone else for the sorry actions of a few. So far this series has seen some clean, close racing from some of its youngest competitors, and if you have a chance to go into the infield during the night you will meet some of the most respectful and mature young racers that you’ll see anywhere at any race track. That in itself is more than enough reason to come out next Tuesday, June 26th for round four and go meet some of the sport’s future stars.